An octopus has keen eyesight, and this one loves to stretch out on the sand and watch the ocean activity. 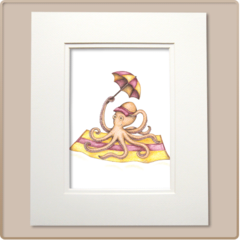 But don't worry about its camouflage because this decorative octopus art print will surely stand out. Cowabunga! Comes wrapped in tissue, tied with a bow!